Fellow food blogger over at King Arthur flour did an interesting experiment on shiny brownies, and determined that the addition of chocolate chips was vitally important to the finished brownie characteristics. What aspect of the chocolate chips is most important for changing the spectral characteristics of the finished brownies – the sugar or the fat (or something else)? We really were not sure if it was the sugar or fat on this one, but we expected one would make a difference somehow! Prepping brownie partitions. Left: one partition built, Right: pan with two completed partitions. 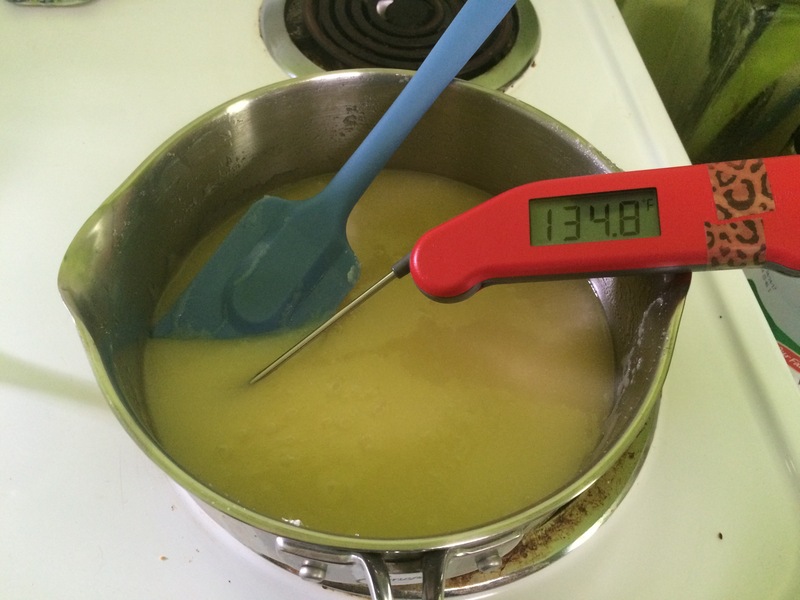 Checking the temperature of the butter and sugar mixture… a tad higher than the 120°F target (oops). Labeled brownies in partitioned pans. V1: original recipe – chips, V2: recipe (with chips), V3: recipe – chips + sugar, V4: recipe – chips + butter. The control recipes (as directed and without chocolate chips), behaved in a similar manner to the results obtained by King Arthur flour (whew!). 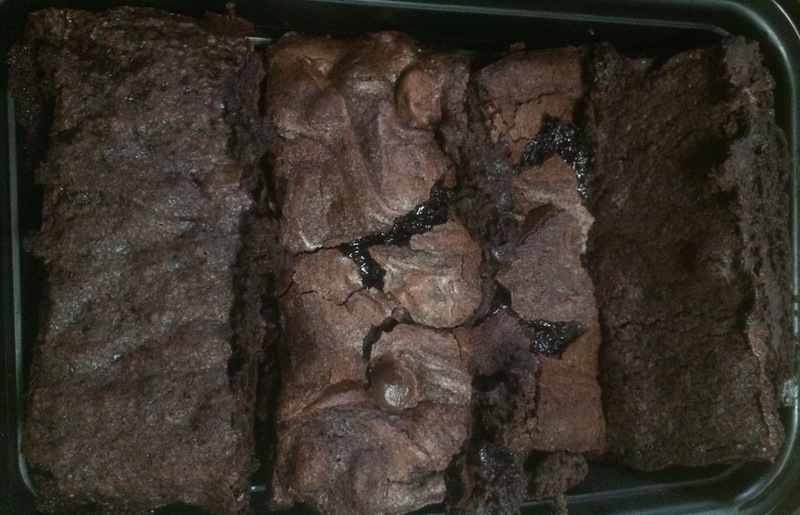 In the image below, it can be seen that the brownie batter with the extra sugar looks similar to the recipe that includes chocolate chips, while simply adding butter resulted in a dull/matte crust. Finished brownies. From left to right: V1, V2, V3, V4 (see previous image). Surprise Results: Even though the extra sugar was simply mixed in, and not dissolved in the melted butter as some of the recipes tested by King Arthur suggested was critical, the crust was very similar to the batch with the added chocolate chips. Conclusion: Based on our small trial, it appears that it is the sugar in the chocolate chips that is critical component for the shine, and not the additional fat. Taste test results indicated that the batch with the chocolate chips was the tastiest, followed by the one with the extra sugar, extra butter, and the plain recipe minus chocolate chips was the least favorite (although, all in all, none would be rejected by our taste testers). Future Questions: Can you replace the sugar with a flavored liquor (e.g. orange liquor) and still get a shiny crust? How important is the temperature of the butter and sugar mixture really? How many other experiments can we come up with before people suspect we just want an excuse to make brownies? Hamel, P.J. 2015. “How to make brownies with shiny crust: the surprising secret ingredient.” Flourish – King Arthur Flour blog. Web. Accessed July 4, 2015. Keep the experiments coming. Where brownies are concerned – more is more!